Understanding the skin's physiology clarifies why it is so effective to use virgin coconut oil for stretch marks during pregnancy. The pregnant body goes through massive hormonal changes, as well as changes in blood volume, nutrient availability, bone texture, and of course, sheer size. Specifically, as everyone knows, the belly grows, but other areas can flesh out as well. When body volume increases quickly, the skin must stretch just as rapidly to keep up. The result is the reddish purple scars, zig-zaggy in shape, that are actually tears in the skin. These marks show up during weight gain or pregnancy, after connective tissue stretches beyond its own limits, similar to the way a piece of clothing may tear if forced to fit on a body that is too large for it. Stretch marks favor those areas where the most fat is stored, and which grow most rapidly in size. For pregnant women that includes the abdomen and breasts, but it can also include the buttocks, thighs, hips and underarm areas. Over time, stretchmarks will fade from red or purple to softer pink, and eventually to a translucent white or silver. They can appear brown in those with darker skin. Regardless of color, shade or intensity, fading can take place more quickly with the use of coconut oil for stretch marks during pregnancy. The scars can also smooth out and be almost undetectable. One terrific strategy is to use coconut oil for stretch marks even before they appear, from the moment a pregnancy is confirmed, for instance. This can prepare the skin for easier stretching and might prevent stretchmarks from appearing at all. Coconut oil has moisturizing and healing abilities that make skin more elastic and stretchable, softer, more supple, and better able to heal. Oil deeply penetrates multiple layers of skin as antioxidants counteract aging. Nutrients help regenerate and heal skin cells, and a camouflaging effect takes place. Anti-viral, anti-bacterial, anti-fungal, anti-microbial and anti-inflammatory elements work together to keep the scars from swelling or getting infected. For better results when using coconut oil for stretch marks during pregnancy you should use it often and liberally. Every woman is different, but there will always be improvement. The level of improvement can depend on age, oxygen intake (including factors such as exercise and non-smoking status), overall immunity and health, skin condition, nutritional status, severity of scars, skin color, and when the scars appeared vs. when treatment began. To prevent formation of scars, the oil can be gently but thoroughly rubbed into belly, breasts, hips and thighs three times daily. For existing scars, the oil can be massaged into affected areas each night before bed. Exfoliate beforehand with warm or even hot water to stimulate cell circulation, production and healing, and to increase positive results. Stay hydrated: Drink four ounces of water daily for every pound of body weight. Add soup, smoothies or herbal tea as well, and eat a diet rich in fruits, vegetables and essential oils. In addition to those tips, pregnant women should engage in stress-reducing and stretching exercises, as well as simple movement exercises, such as walking. This helps maintain weight and also improves oxygen flow and circulation, all of which makes for healthier skin. 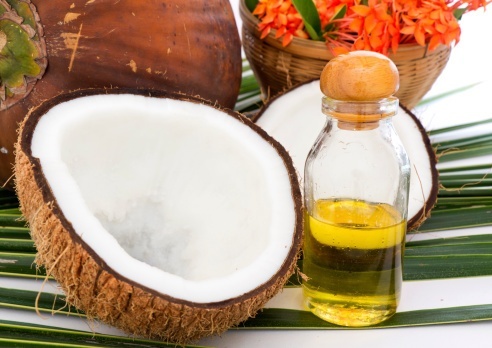 Virgin coconut oil is also great for moisturizing skin and hair, before, during and after pregnancy. We founded Biconi after experiencing the healing power of natural ingredients. From our home in South East Asia, we hope to bring to you the wonders of our heritage, in the most natural way. Be the first to hear about our latest product updates, offers and members-only specials. Sign up today and receive 10% off your first order. Copyright © Biconi 2019. All right reserved.